Compact track loaders are built like little Sherman tanks. Engineered with a dedicated undercarriage, these tool-carrying cousins of the skid steer can attack a lot of jobsites a skid loader just can’t (and some it can, just better). For example: When it comes to winter work, track loaders excel at snow removal, being heavier and having more tractive power. When it comes to dirt work, tracks generate more power and precision to move and smooth earth in grading operations. 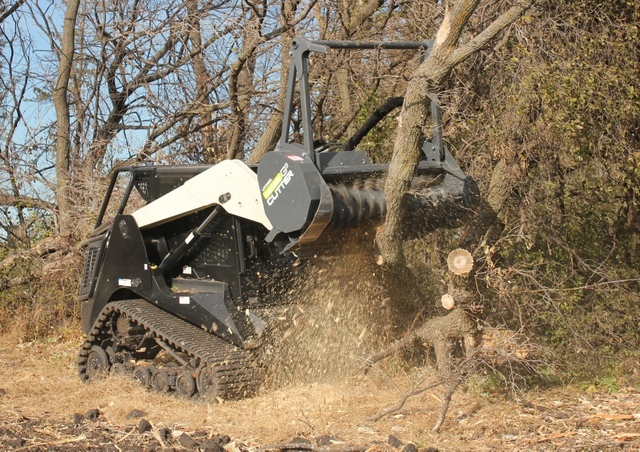 Same with land clearing: Compact track loaders can crawl through jungles and spearhead the abrasive job of brush cutting better than wheeled units. Track loaders just need the right attachment to conquer each of those missions — a snow blower, brush cutter and blade — three implements that work better on a compact track loader than a skid steer. Most snow blowers range in size from 4 to 8 ft, and they can throw snow up to 45 ft. Compact track loaders extend seasons. During the wet weather months, these track machines can work earlier and later where skid steers can’t (because tracks have better flotation, so they don’t tear up surfaces or get stuck). In winter, heavier track loaders are just better for snow removal, and many manufacturers offer snow tracks for increased grip during the chilly season. Equip a track loader with a snow blower attachment, and you’ll have a nimble, high-powered snow removal machine. For snow depths larger than 2 ft, snow blowers provide the best solution to relocate the material so the path can be cleared. Snow blowers are the perfect attachment for clearing snow from driveways, sidewalks or any area a track loader will fit. They can also blow snow into trucks that can haul away the material (an optional truck chute kit is often available). The typical in-cab electrically controlled adjustable chute rotates left and right, and the deflector controls the height of the discharge, allowing you to position the material exactly where you need it to go. Most snow blowers range in size from 4 to 8 ft, and they can throw snow up to 45 ft. Snow blowers are available for standard- or high-flow hydraulic units, but we suggest a high-flow auxiliary function for most loaders. High-flow models capture the increased available hydraulic horsepower to power through the deepest drifts and the heaviest snow to throw farther. “There are numerous snow blowers that work fine with standard auxiliary hydraulics — 18 to 24 gpm — but the larger, higher productivity units which throw snow greater distances usually require 25 to 35 gpm,” Chaney adds. Be sure to look for a hardy, replaceable cutting edge and adjustable skid shoes, which can be set to scrape pavement clean or higher to remove snow from gravel lots and driveways. If using a snow blower on material high in moisture, it is important to check the shoot often for clogging. If not cleaned properly before storage, the snow and ice in or on the unit can freeze and cause damage. Because they ain’t cheap. “Snow blowers for compact track loaders can range in price between $8,000 to $15,000, depending on size, width and features, such as manual or hydraulically actuated discharge chute rotation,” Chaney says. In contrast to snow, land clearing and mulching head applications are “hot” segments for compact track loaders. Professionals are buying track loaders with mulching heads, and they’re clearing right-of-ways and land for commercial or housing developments. Skid steers just won’t work in that sector because of unstable terrain in the forest, and a track machine outfitted for brush cutting (an attachment and proper protection) is considerably cheaper than the $100,000-plus dedicated brush cutter machines in the industry. For the cutter itself, there is a tooth for any application — from working around rocky conditions to specifically cutting down trees. First off, make sure the compact track loader’s lifting capacity and front, auxiliary hydraulic system matches the mulcher. Some manufacturers offer units for both standard- and high-flow compact track loaders, but the latter is more popular. Talking about compact track machines, forestry mulchers can require flows from a minimum of 13 gpm (standard flow) all the way up to the heavier, high flow that requires up to 45 gpm. Of course before operating, the track loader itself should have a comprehensive protection kit (brush cutting requires serious safety precautions). Here’s a common checklist of safety equipment: an exhaust cover to prevent debris entering the engine bay; cab-glass reinforcement and metal mesh covers; front work light protection; a loader hydraulic hose and auxiliary coupler guards; air conditioning; FOPS guard with side protection; and a cooling pack guard. For the cutter itself, there is a tooth for any application — from working around rocky conditions to specifically cutting down trees. When it comes to picking a safe brush cutting attachment, many different types of heads are available in the market today (each manufacturer is a little different). Your buying decision needs to be based on the application (your customers’ needs), operating costs (fuel and consumable knife costs) and maintenance requirements (time). For light brush and maintenance mowing, there are the rotary, deck-type mowers with two large swinging blades, but they tend to be less effective in heavier material. 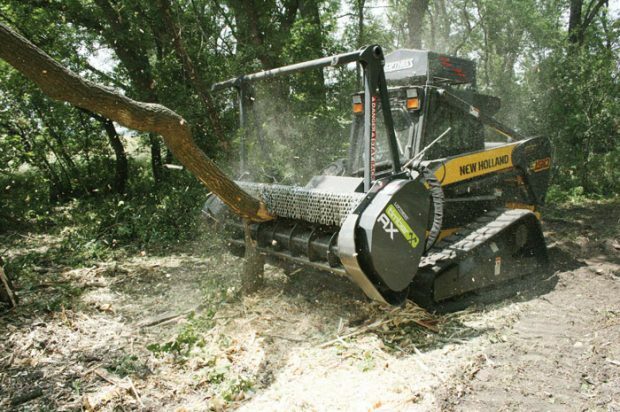 For this article, we will focus on mulching heads designed for heavy-duty brush shredding applications, such as land clearing for fire breaks, real estate development and right-of-way maintenance. In this arena, horizontal drum rotors with fixed cutters have emerged as the most popular type of head. The fixed teeth always maintain the correct angle of attack, and the material size you can handle is limited only by available horsepower and the size of the equipment carrying the head. Units often come in common sizes such as 60, 66, 72, 76 and 90 in. There are many blades to choose from for a compact track loader — V, snow, box, grader and dozer. Although each is designed to do a specific task on a jobsite, the main function of any blade attachment is to push and level material (two operations usually done better with a compact track loader). A V-blade attachment is one of the most versatile blades available. This attachment uses the variable angle blade as a V-plow, scoop, straight snow blade or an angled snow blade. Angled grader blades are popular for doing leveling for concrete or asphalt or just general site prep work like this. Angled grader blades are popular for doing leveling for concrete or asphalt or just general site prep work on the jobsite. These blades can either be angled manually or remotely using the unit’s auxiliary circuit. Compared to straight blades, these blades offer a wider contact area to the ground and great grading capabilities, as well as the ability to adjust cut depth on the go. Because they excel at excavation, dozing and grading tasks, dozer blades can be used in everything from site prep to finish grading. These heavy-duty blades allow the operator to use their compact track loader like a small finishing dozer. But it’s not just dirt work. 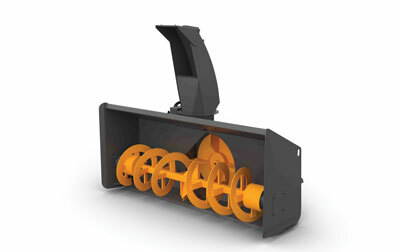 As mentioned earlier, track loaders excel at snow work, so snow blades are popular as well. Snow blades can be as narrow as 3 ft or as wide as 10 ft, depending upon the size of the loader, and can push a tremendous amount of snow at high speeds. For contractors using a snow blade, adjustable skid shoes allow the operator to vary the height of the plow edge on various surfaces. Compression trip springs let the operator disengage the plow when encountering solid or heavy obstacles, such as rocks. All of these different blades (with the exception of the snow blades) can be wired up to receive laser coordinates, giving the attachments the ability to read X and Y axes to get the final grade within a tenth of an inch. 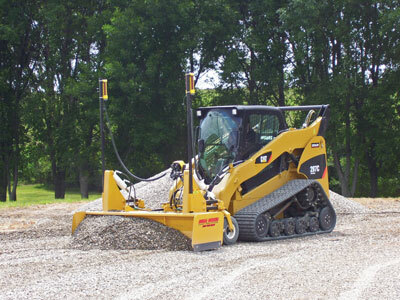 Take accurate dozing to small track loader levels. The Dual Dozer is the ideal attachment for the contractor who wants accurate and timely subgrades. Its compact design takes the extra cost of material and labor out of the equation with the compatibility of various automation systems (laser receivers, 3D or GPS). The Dual Dozer operates independently of the skid steer, allowing it to independently tilt, rise and lower from the input of the guidance system. With a hardened replaceable blade on the front and back, the operator won’t waste time pushing or pulling material throughout the worksite. Each receiver works independently from the other, keeping a more accurate grade and allowing dual slopes. 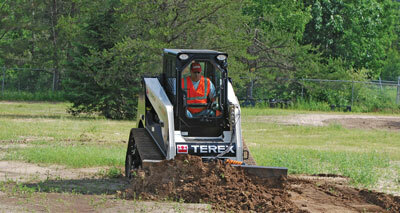 The standard unit is available with a skid steer or three-point attachment option. Base models come in 6-, 7- and 8-ft sizes. Consider the Dual Dozer a great investment for the contractor looking to save time and money. For more info, visit dualdozer.com or call 800-446-8222. Furthermore, the undercarriage on the TL12V2 has been lengthened for greater stability and improved ride quality. 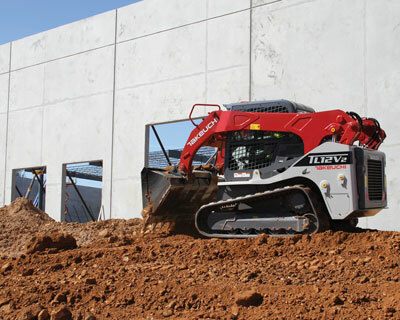 Pushing the boundaries of power and size in a track loader, Takeuchi-US recently introduced the all-new TL12V2 track loader, the first vertical-lift model in its lineup and the largest vertical-lift track loader in the industry. Built with increased performance features, the TL12V2 vertical-lift loader arrangement delivers 45 percent greater operating capacity over the current TL12 radial, says Takeuchi. The new track loader is powered by a Kubota 3.8L diesel engine that is U.S. EPA Tier 4 Final emissions compliant and produces 111.3 hp and 284 ft-lbs of torque. The design of the rear cross member also provides optimum visibility to the rear of the machine. Additionally, the operator’s station has been completely revamped with a wider cabin for comfort and accessibility. A new 5.7-in. color multi-informational display keeps the operator informed, while the precision pilot controls and a new Active Power Control system provide impressive control of the machine. For more info, visit takeuchi-us.com. We really like our new T870 Bobcat CTL. We did expect to replace our D3 Cat with the 8′ heavy duty Bobcat Dozer attachment. So far we have not been able to control the dozed attachment well enough to do away with the D3. You absolutely cannot see the dozer blade ends from the cab so I haven’t figured out how you could possibly do finish work with the attachment. Also the machine digs in and oscillates up and down a lot. I would love to watch someone make it work at the level we expect. We thought maybe the remote control unit with the operator standing to the side would be better. Tried one on demo from Bobcat. No way any of us could do finish work with it. So far the bucket has been the go to attachment for finish work. We did pick up a used Bobcat Grader attachment that works fairly well on skinny driveways.